Tripp Lite's TLP74RB offers economical AC surge suppression for protection of workstations, desktop PCs, telecom systems and other sensitive electronics. Built-in AC surge suppression shields connected equipment from damage and performance problems due to transient surges. TLP74RB offers 7 total outlets (6 at right angle and 1 designated transformer plug outlet), 1.22 m (4-ft.) cord and diagnostic LED to warn of suppressor damage. AC suppression rated at 1080 joules shields equipment from surges and line noise. Attractive black housing with keyhole mounting tabs offering convenient protection of desktop computer equipment and accessories. 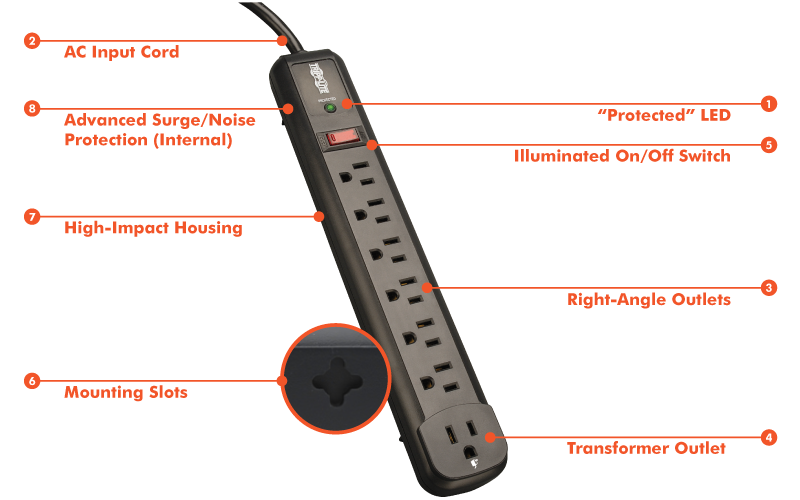 With an optimized array of right-angle outlets, this surge protector is perfect for mounting to your wall, desk or media cabinet while keeping cords neatly organized. Use it to protect home and office electronics of all kinds, including computers, monitors, printers, wireless routers, televisions, video game consoles, streaming media players, sound systems, device chargers, desk lamps and small appliances.